It’s soup time! Soup weather is the best weather, do you agree? Soup is one of my favorite things to cook because it’s easy and filling, and can most of the time be made in just a few minutes. 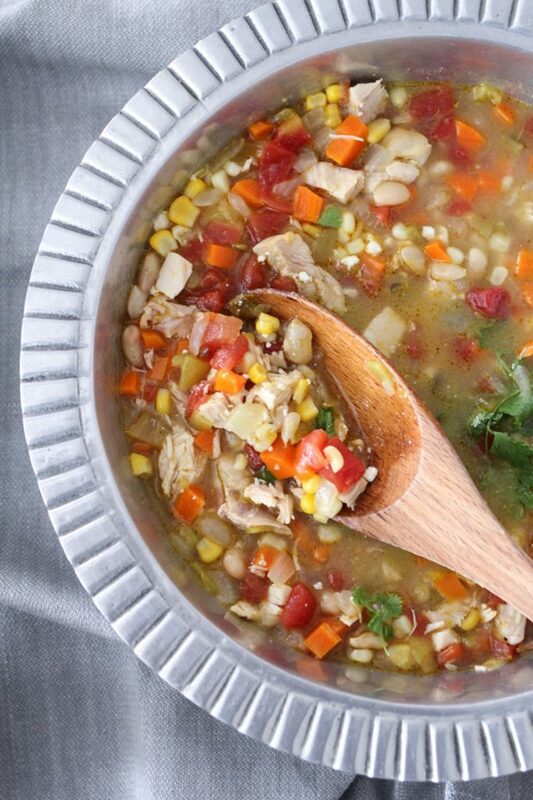 Homemade Cafe Rio Chicken Tortilla Soup is one of our favorites! I love the flavors in Cafe Rio’s Chicken Tortilla Soup. It’s packed with veggies and chicken and is made with a simple chicken broth base. The tomatoes in the Rotel give this soup a nice flavor as well. 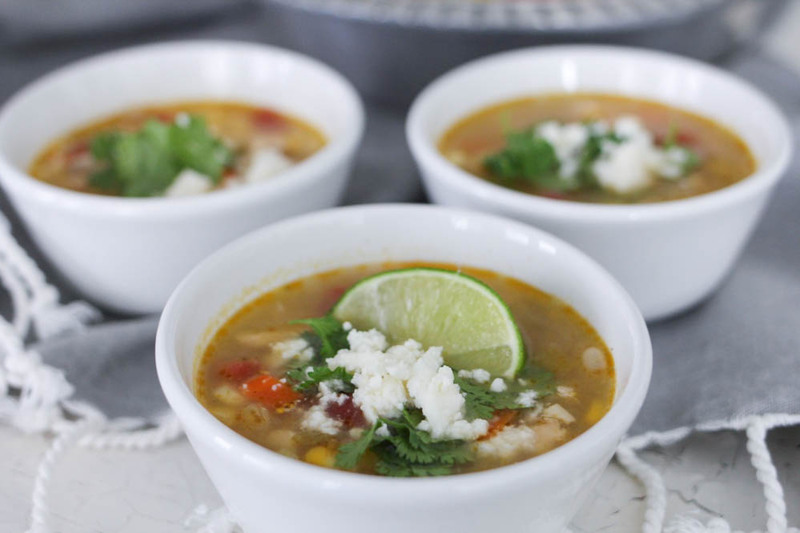 I experimented with lots of white chili, and tortilla soup recipes (also using Cafe Rio’s soup as a model) before finding the perfect combo for this Homemade Cafe Rio Chicken Tortilla Soup. 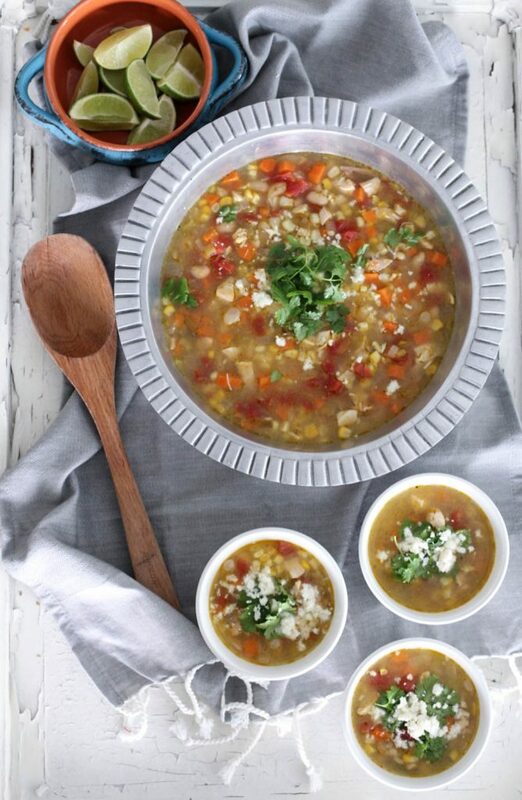 If you love the flavor of Cafe Rio’s soup, add a scoop of guac to this recipe just before serving. Do not make this soup unless you have grated cheese and tortilla chips to pile on top of the soup! That’s the only way to eat it, in my opinion. Oh, and a squeeze of fresh lime! 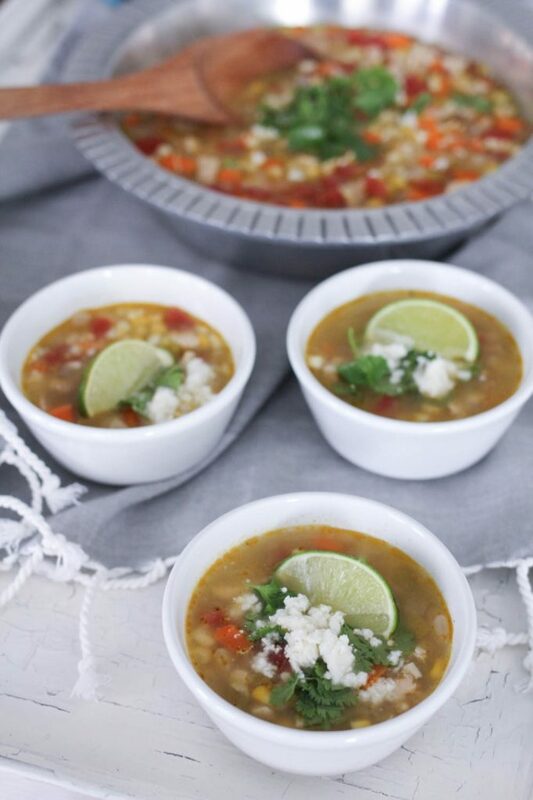 Making this soup is so simple and stands alone as the perfect main dish on a cold evening, or is also perfect as a side dish for a Mexican style meal! One recipe serves 8 as a main dish. If you serve this as a side dish, it will serve approximately 12 in small bowls. I love to serve this with a simple cheesy quesadilla or chips, guac and salsa. I don’t know a single person who doesn’t love this soup. My grandkids eat it often, and my daughter Corrine loves to make it because it’s a quick and easy dinner after a busy day of work! Interested in making more copycat Cafe Rio recipes? Serve with guac, sour cream, grated cheese and tortilla chips. Heat olive oil in pan over medium heat. Add chicken and cook until light brown on both sides, about 2 minutes per side. Season with salt and pepper while cooking. Add 3 cups cold water to pan, cover and simmer chicken on medium high heat until cooked through, about 8 minutes. Remove chicken and set aside. In same pan, add onion,carrots, chilies, garlic, cumin and Rotel to juices, and add enough broth from carton until vegetables are covered. Simmer for about 10 minutes, or until vegetables are tender. Chop the chicken. Add chicken, beans, corn and fresh lime juice to vegetable mixture in pan with remaining broth. If additional chicken flavor is needed, add some chicken flavoring to taste. Salt and Pepper. Garnish with fresh cilantro. Serve with tortilla chips, guac, grated cheese, sour cream. What do you mean by Chicken flavoring? Bouillon? you may use bullion or other flavoring products. I use Knorr or “Better than Bullion” most of the time. I’ll make a note on the recipe. Thanks for reading ABK! Yes, bullion cubes or granules or I often use Knorr flavoring as well. Know is sold in little mini “tubs” about 4 per package. They are concentrated liquid chicken flavoring, they also come in beef flavor. Thanks for asking. I amended the recipe to include a note! How many cubes of bullion would you recommend using? I would start with 1-2 and then taste to see if it is enough flavoring. If more is needed, add an additional bit of bullion. Hope you love this recipe! I’m so excited to try this!! I LOVE Cafe Rio’s soup!!! A couple questions for you-what is the rotel tomato lime juice and cilantro?? Also, because of food sensitivities, I can’t use most chicken flavoring/boullion-do you have a rec for a replacement?? It is a can of tomatoes, lime juice, cilantro and other items all in one product. Usually sold near the Mexican food items or near the canned tomatoes in the grocery. Any flavor will do, some are spicier than others so read the label carefully! Thanks for reading ABK! Made it last night for dinner and it was AMAZING!!!! Thanks for the fab recipe. I think we’ll be eating this on repeat all fall/winter long! I would like to make your recipe in the pressure cooker. Any advice or recommendations? I’m so glad to hear that, Hilary. That’s why I love this recipe, it’s so easy, convenient, and simple. Thanks for sharing and for reading ABK! I saw this on your Instagram feed and was inspired to make it. It turned out great. We all know how hard it is to please 5 kiddos at dinner time and they all liked it. Thank you for making dinner in our house a joy. You’re welcome, Liz. I know how hard it can be to make something everyone will enjoy, especially with kids! But this soup is about as yummy as it gets. Thanks for sharing and for reading ABK! Made this for dinner because I had all ingredients and didn’t have to go shopping for any ingredients. So quick and easy. We all loved it…even my 2 year old ate it and asked for seconds! Question! Do you leave to water in the pan from cooking the chicken and add to it, or was the water just for cooking the chicken and discard after the chicken is cooked?! Thanks! Thanks for this recipe! I’ve made it several times in a couple weeks. For my family, and others. Everyone loves it. I was in rush one time and used rotisserie chicken and chicken broth and was ok too. Thank you!!! !